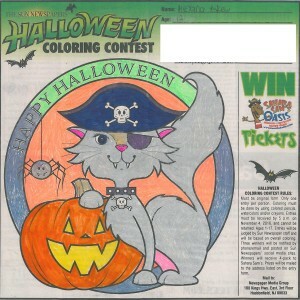 The Sun is proud to announce its winners for the Halloween Coloring Contest. Published in all of our newspapers, children from around South Jersey colored a Halloween scene and sent their creation to us. Winners of the contest received a four-pack of tickets to Sahara Sams! The winners for Shamong are Alanna Sokorai, 4, Kayance Askew, 13, Malia and Kevin Landolt, 7 and 5. To see the winners’ entries, please visit our Facebook page, www.facebook.com/shamongsun.